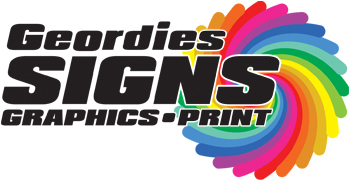 Geordies Signs is a family run print & sign business based in County Durham. We offer a comprehensive list of signs including: Interior & Exterior Signs, Etch Window Graphics, Vehicle Graphics & wrapping, Banners, Display Products, Labels and Stickers & Health & Safety Signage. We also offer Trophies, laser Engraving, Printed Clothing, Business Cards, Leaflets and much more. We provide our knowledge and expertise in design and use the latest software and machinery to produce quality signs specific to our clients needs. Our aim is to ensure the highest standards of work at affordable prices. If you cant find what youre looking for please contact us and we will be happy to meet your requirements. At Geordies Signs no job is too big or too small! Why not follow us on Twitter or like us on Facebook! Geordies Signs covers Consett, Stanley, Chester-le-street and the surrounding areas for signage, windows graphics, wall displays and coverings, vehicle graphics & wrapping. We can also supply personalised clothes printing for businesses, schools, hen parties & lots more!